The 2015 FIS Alpine World Ski Championships in Vail and Beaver Creek from 4th – 16th February 2015 will showcase over 700 athletes from more than 70 nations. 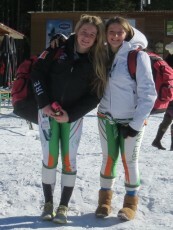 Victoria & Florence Bell (aged 20 and 18) will compete alongside each other in Slalom and Giant Slalom in Alpine Skiing. Victoria has represented Ireland at the EYOWF in Liberec, Czech Republic in 2011 and the World Alpine Ski Championships in Schladming, Austria in 2013. Florence has represented Ireland at the inaugural Winter Youth Olympics in Innsbruck, Austria in 2012, the EYOWF In Brasov, Romania in 2013 and the Winter Olympics in Sochi, Russia in 2014. A combination of age category boundaries and the number of places available at individual events has conspired to prevent the sisters from competing together at the same event … until now. They are very excited to have been chosen to represent Ireland at the World Alpine Ski Championships in Vail and Beaver Creek in February this year.